﻿ Public Cloud Deployment-What is a Public Cloud? Public Cloud is one of 4 types of Cloud Infrastructures available in the marketplace. The Public Cloud consists of a variety of subscribers or clients that store hosted applications and files, data, and other resources on a virtual server. These services are made available to the general public and are shared bymultiple clients through a service provider. 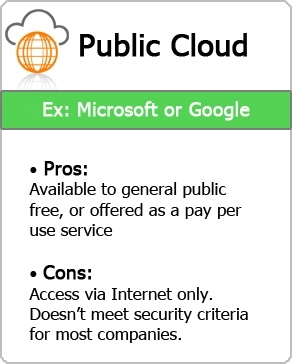 Public Cloud Services are free or offered on a pay-per-use model. Generally, service providers like Microsoft and Google own and operate the infrastructure and offer access only via Internet (direct connectivity is not offered). If you work with confidential information, documents or intellectual property, this is not the right cloud model for you. Students or Subscribers that do not need to secure their data.